The Resources are Food, Ammunition, and Health. 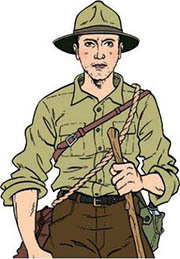 The areas of Expertise are the Jungle, Navigation, and Camping. 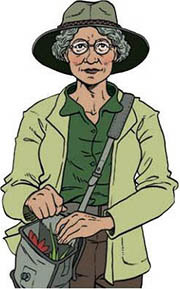 Each explorer is a specialist in one area of Expertise, as represented by the symbol on their card. The explorers are otherwise identical. If an explorer loses their last Health token, they die. They are removed from the game and cannot return. If all three explorers die, the players immediately lose. The core of the game is the adventure cards. Each one represents an encounter in the jungle. To succeed you'll have to make sure these encounters happen in an order which the explorers can survive. Sometimes the cards will be obviously positive or negative, but usually they will be a mix of both. Each card has a name and a number (on the bottom), and a series of caption boxes (near the top). 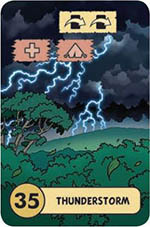 The caption boxes represent the things which will happen to the explorers when you encounter this card. Each caption box has a number of symbols, which tell you which actions you must take when the caption box is triggered. You must respond to each symbol in a caption box in order from left to right. There are three types of caption box: Events, Choices and Options. Many cards will have multiple types of caption box. In these cases, they must be resolved in this order: Events, then Choices, then Options. Events (yellow) are compulsory. You must trigger every yellow box on a card you play. Triggering means taking all the actions within that box. Choices (red, jagged) are also compulsory, but you must choose a single red box to trigger per card, ignoring any other red boxes on that card. Options (blue, curling) are optional! You may choose to ignore, or trigger, each blue box on a card. Each caption box has a number of symbols. These symbols are also listed on the player aids and at the back of this rulebook. About half relate to Expertise and Resources, while the others affect the path of cards itself, or the expedition as a whole. 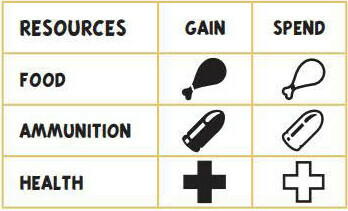 Each Resource and Expertise symbol has two versions: gain and spend. Ammunition, you cannot trigger a caption box with a 'spend Ammunition' option. Discard a card from your team area with the matching gain symbol. Lose one Health token from an explorer with the matching Expertise. Lose two Health tokens from another explorer. When a card in your team area has multiple gain symbols on it (e.g. 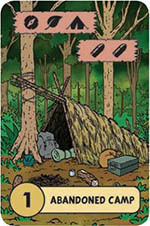 1 - Abandoned Camp) that card can only be used and discarded once. 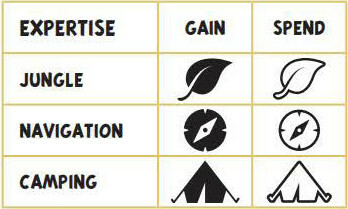 Cards with more than one type of gain Expertise symbol are more flexible, but cannot be reused. You must discard the next card in the path. If there are too few cards remaining in the row for a symbol to take effect, ignore it, but if there are enough cards, the action must be taken. Advancing through the expedition cards is the only way to win the game! Both of these symbols happen immediately, before you trigger the rest of the symbols on a card. This means that it's possible to win the game before hitting a card or a symbol which would cause you to lose. 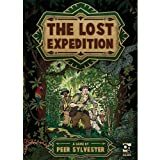 The explorers discover an abandoned camp! They must learn what they can from it, or loot its resources. Depending on which red caption box you choose you will either get two Ammunition tokens, or you will keep the card itself for its gain Expertise symbols, putting the card in your team area. This card has all three gain Expertise symbols, but it can still only be used once. This means that the card can be used when you need to spend any single Expertise, and is then discarded. The explorers must take shelter during a storm! First, they will skip the next two cards. Then they must either take shelter, or get injured. Take one explorer of each Expertise and put them on the table to form your team area. It doesn't matter how many players are playing, you always use exactly three explorers. Take three Ammunition tokens and four Food tokens from the supply and add them to your team area. Shuffle the adventure cards, deal four to every player, then place the remaining deck face-down. If playing with two players, deal six adventure cards to each player. There are three difficulty levels for the game: easy, which we recommend only for people who are learning to play the game, normal, and a hard mode for experienced explorers. Easy - use seven expedition cards. Place four Health tokens on each explorer. Normal - use nine expedition cards. Place four Health tokens on each explorer. Hard - use nine expedition cards. Place three Health tokens on each explorer and take one extra Food token. Place your expedition cards in a row in the centre of the table, ending in the lost city, and place a pawn on the first expedition card at the opposite end. Place the Morning/ Evening token on 'MORNING', and put the remaining tokens aside as a general supply. Choose a player to go first, and give them the expedition leader token. Return any extra pieces to the box. If playing with five players, remove one Food token from your team area before play. You need your pawn to reach the final expedition card, the lost city of Z, before your team of explorers dies, or runs out of time. You'll need to strike a balance of steady progress, without taking too many risks which may injure your explorers. 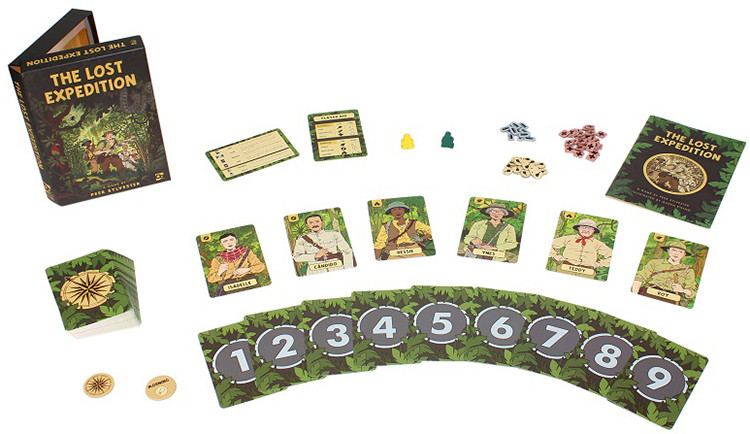 Players will discuss tactics and the cards on the table at multiple points during the game, but you must never reveal any details of the cards in your hand. 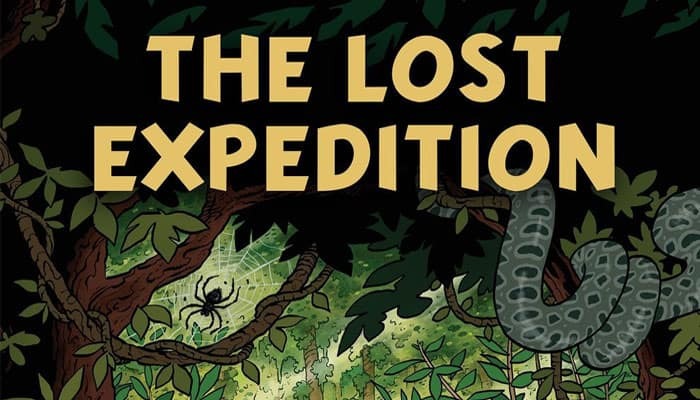 The Lost Expedition is played in a series of rounds, which represent a day in the life of the explorers. Each round consists of two hikes, Morning and Evening, and after each hike the explorers must eat. At the end of the round, players will draw a new hand of cards. Starting with the leader and going clockwise, each player plays one card at a time face up into the middle of the table until each player has played two cards. The cards should be in a single row visible to everybody. This forms the path the explorers are taking for this hike. In a two-player game, play three cards each. Once this is done, arrange the cards in numerical order from lowest to highest. It may be easier to put the cards in order as they are played, rather than waiting until everyone has finished playing their cards. Now resolve each card one by one, in order from left to right. Once you are finished resolving a card, if you haven't gained it due to an Expertise symbol, then discard it. In all cases, players should discuss any choices they have to make, but the leader has the final say. Once all the cards have been resolved, flip the Morning token to Evening - the team now loses one additional Food. In the Morning cards in the path are rearranged in numerical order. Evening is similar to Morning, with two exceptions - players will be playing all of the remaining cards in their hand, and cards now remain in the order in which they are played. Each new card is added to the right of the previous one, and they are not rearranged by number. Resolve the cards as normal, then flip the Evening token back to Morning - lose one additional Food. In the Evening cards in the path remain in the order in which they are played. At the end of every round pass the leader token to the next player clockwise, then each player draws four cards from the adventure deck. If the adventure deck is empty, the players immediately lose one Food, and then shuffle the discards to form a new deck. If the deck is empty for the second time in the game, the players immediately lose. In a two-player game, each player draws six cards instead. The moment the pawn gets to the lost city of Z, the players win. If all three explorers are dead, the players lose. Can Ispend one Expertise instead of one Health? No. Only Health can be spent for the lose Health symbol, or for times when you are out of Food. If Iwant to avoid spending Health from the explorer with a certain Expertise, can Itake one Health from both other explorers instead? No, you must take both Health tokens from one other explorer. Why are there so few gain Ammunition symbols? Bullets are difficult to come by in the jungle! Use them sparingly. Where do Iplay cards in the Evening? Make sure you're adding card to the right of any existing cards as those cards are oriented. This may be different to your right if you are sitting opposite another player, and are looking at the cards upside-down. Do Ihave to make a swap? No, the swap is the only symbol which is always optional. In the head-to-head, do Ihave to spend the Food at the end of the Morning or Evening if the game is ending? No. You must complete the path, which may result in a tie, but you stop there.